July 1924 - October 2017 Meliton (Mel) Ayay Adversalo, 93, of Honolulu passed away peacefully on October 5, 2017 after a brief illness. Mel was born in Kahuku, Oahu on July 15, 1924 and was a retired electronics technician with the Hawaii Air National Guard & Federal Aviation Administration and an Occupational Health Inspector with the State of Hawaii, Department of Labor. He is survived by daughters Kathleen Ramento (Sal (deceased)) and Suzanne (Chris) Lott, son John (Maria) Adversalo, grand- children - Jeremy Adversalo (Veronica), Shane Adversalo, Anthony (Josselyn) Lott, Daniel Lott, and great-granddaughter, Elizabeth Lott. Celebration of life: Saturday, November 4. Aloha Attire. 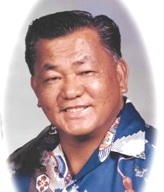 9:30 a.m. visitation, 10:30 a.m. service and reception - Borthwick Mortuary, Mauka Chapel. 2:00 p.m. - Burial at Hawaiian Memorial Park.